Coolidge Corner Condo, located in a very desirable, sought-after courtyard elevator building on a high floor. Serene treetop views throughout. This home has 2 spacious, well-proportioned size bedrooms. Features a tastefully renovated kitchen. 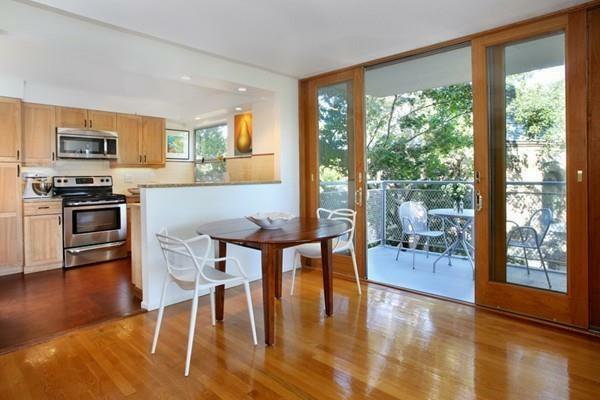 Open living-dining room combination leading to newer insulated sliding glass doors to recently redone balcony. Great closet space, including a walk-in master closet. There is additional deeded storage space. There is beautiful hardwood flooring throughout. Wonderful oversized picture windows throughout. There is a deeded heated garage parking space included. Minutes to C line, D line, park, school. shopping, restaurants, and Longwood Medical area.